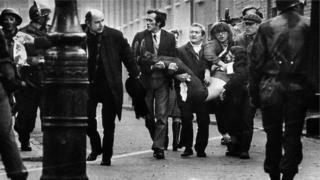 The sister of a man killed on Bloody Sunday has described a former soldier's comments on the shootings as "very cold and very brutal". Thirteen people died on the day and 15 were injured after troops opened fire in Londonderry in January 1972. The former paratrooper told the BBC that he feels no guilt for what happened. He said he still considers it a job well done. The Saville Inquiry into the killings concluded that all the victims were innocent. Speaking to the BBC's Peter Taylor, Sergeant 'O' said that Lord Saville was not there on the day and whilst he accepted that some of those who were killed were innocent he did not accept that all of the victims were innocent. Kate Nash, whose 19-year-old brother William was shot dead described the soldier's comments as cold and as a lie. "What a horrible lie to continue to stand by, even as you become an older person. "Very cold and very brutal." Eighteen ex-paratroopers have been reported to the PPS over the killings and the Bloody Sunday victims are currently waiting to hear if any will face charges. Lord Saville's official inquiry into the killings concluded that all victims were innocent and posed no threat. The paratroopers, he said, lost their self-control and fired without discipline. His unequivocal conclusion led the then prime minister, David Cameron, to deliver a historic apology in the House of Commons and to the people of Derry. What happened on Bloody Sunday, he said, was "unjustified and unjustifiable. It was wrong". The Police Service of Northern Ireland (PSNI) began a murder investigation following the report. The BBC previously obtained a letter from a senior public prosecutor detailing the criminal charges the soldiers could face. They include murder and attempted murder, wounding, perjury and joint enterprise, which means an offence where two or more people are involved.